The logical consequence of playing chromatically on a diatonic harmonica is that you can now consider your favorite instrument as any other soloist instrument (saxophone, trumpet, clarinet…) and approach music from theory and harmony. The rookie improviser would better use a generic book about harmony or the excellent “Precious Book”, by Sebastien Charlier. These books fully show what is at stake when it comes to improvisation : major and minor scales harmonisation, chord cadences and associate scales. 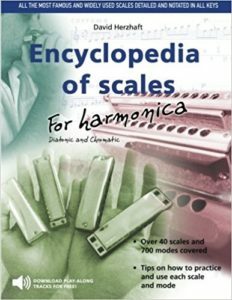 The encyclopedia of scales by David Herzhaft focuses on all the scales used in jazz and other kinds of music. Practicing these scales on a regular basis is a key success factor for both mastering the instrument and improvising. The heart of this pack is really the DVD in which David Herzhaft shows almost all the scales. For each scale, he explains how it’s made, then he plays the scale notes and finally he improvises with a backing track (one key by scale). For each scale, David shows the most usual modes and the chords to play on. Explanations are crystal clear, and the excellent improvisation examples really show perfectly well how the scale really sounds like. Each scale is available in each key (intervals + score + tab) in the book and the improvisation is also written out on score and tab in the exercise book. And the backing tracks are also available in the pack (mp3 zip format). Then you’re ready to go ! This pack is really effective. Each scale deserves a lot of personal work and a long time effort for you to get it. And the encyclopedia provides both scholarly and funny approaches to work. The scales you will find in the pack are the following ones : major, melodic minor , harmonic major; double harmonic minor and all their modes. Pentatonic, major and minor, blues, minor 6 pentatonic (also dominant pentatonic), m7b5 pentatonic, diminished, half-diminished, by tone, augmented, 9 tones augmented. And 5 Bebop scales, 8 rare pentatonic scales and 8 rare scales on top of that. On top of solo transcription, you will also find (in the book of exercises) 12 studies (one for each major scale) providing examples showing sequences of notes in the given key. The ultimate goal being to help the player to technically master the instrument and then to create his or her own sequences. The backing tracks DVD features loops, on the following chords, in every key : Maj7, Maj7#11, Maj7#5, Min7, MinMaj7, Min7b5, 7, 7#11, 13b9, 7 Alt, major and minor drones majeur (slow and fast for each), ii V I major and ii V i minor. Loops are played in various styles and can be gathered into a single backing track on a chord grid (operating instructions included in the pack). The musical quality of loops is very good, especially on minor drones (loops only featuring the root and the third), providing a nice oriental ambiance and allowing the player to work on all minor scales. Do you need to buy all the pack ? Probably not. 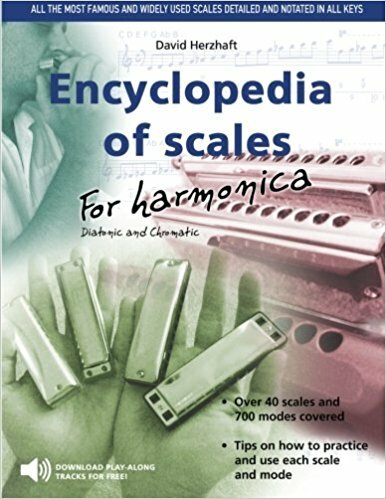 Of course, the whole pack is really interesting, but you can only buy the DVD, and possibly the book « Encyclopedia of scales » if you want to have a scale in a given key right away, without having to mentally build it from the interval structure. This encyclopedia is probably going to be the book of choice for every harp player willing to really study improvisation. However, this book doesn’t aim to deal with relationships between chords (out of a very short part about II V I), so it would be relevant to complement the encyclopedia with a book on harmony and cadences.